Selwyn Harris/Pahrump Valley Times A local man was transported to Desert View Hospital just before 9 a.m., on Wednesday, Sept. 27, after crashing his motorcycle in the parking lot of Green Valley Grocery at Blagg Road and Highway 372. The unidentified man was alert and talking to an NHP Trooper prior to the arrival of Pahrump Valley Fire and Rescue Services crews. The exact cause of the crash is under investigation. The man is expected to recover from his injuries. 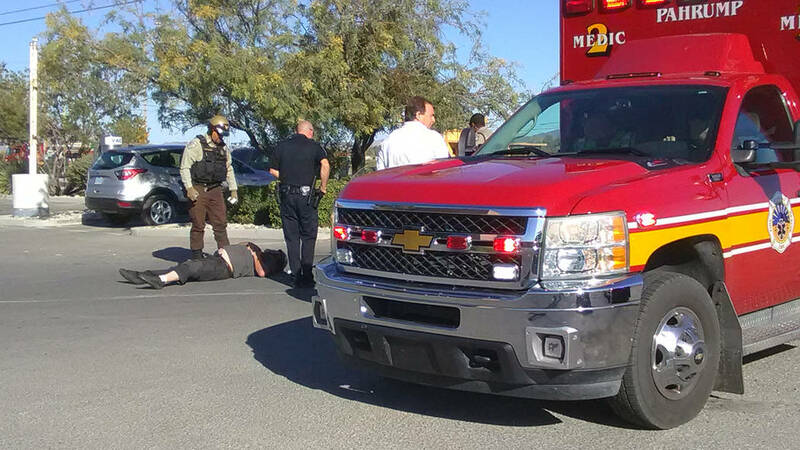 A local man was transported to Desert View Hospital just before 9 a.m., on Wednesday, Sept. 27, after crashing his motorcycle in the parking lot of Green Valley Grocery at Blagg Road and Highway 372. The unidentified man was alert and talking to an NHP Trooper prior to the arrival of Pahrump Valley Fire and Rescue Services crews. The exact cause of the crash is under investigation. The man is expected to recover from his injuries.